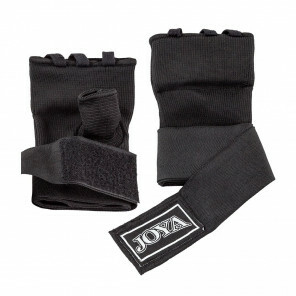 Joya inner gloves in black. Faster and easier to do than bandages, but still offers good reinforcement for your wrist and knuckles. Moreover, your gloves remain dry and fresh through this inner glove. With gel padding for extra cushioning. Sizes: XXS, XS, S, M and L. Also available in black / pink. 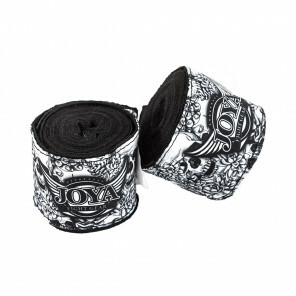 The Joya Fight Fast bandage in green is made of 100% cotton and has a wide Velcro closure. The bandage is soft, slightly stretchy and has a thumb loop to make the bandage easy to do. Through the bandages, your gloves stay dry and fresh. Bandages also offer good reinforcement for your wrist and knuckles. 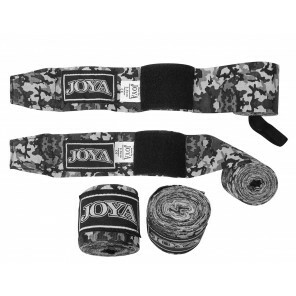 The Joya bandage in camo gray is made of 100% cotton and has a five centimeter long Velcro closure. The bandage is soft, slightly stretchy and has a thumb loop to make the bandage easy to do. Through the bandages, your gloves stay dry and fresh. Bandages also offer good reinforcement for your wrist and knuckles. 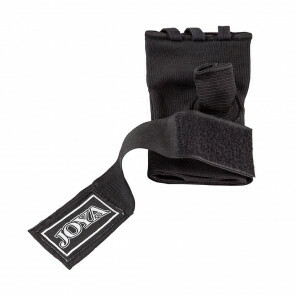 This Joya elastic bandage in black has a wide Velcro closure. The bandage is soft, elastic and has a thumb loop to make the bandage easy to do. Through the bandages, your gloves stay dry and fresh. Bandages also offer good reinforcement for your wrist and knuckles. The bandages are available in 350 and 480 cm. Joya inner gloves in black / pink. Faster and easier to do than bandages, but still offers good reinforcement for your wrist and knuckles. Moreover, your gloves remain dry and fresh through this inner glove. With gel padding for extra cushioning. 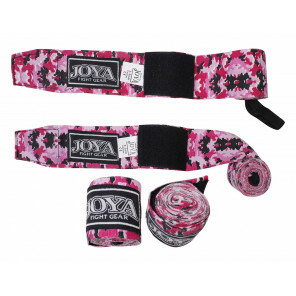 The Joya bandage in camo pink is made of 100% cotton and has a five centimeter long Velcro closure. The bandage is soft, slightly stretchy and has a thumb loop to make the bandage easy to do. Through the bandages, your gloves stay dry and fresh. Bandages also offer good reinforcement for your wrist and knuckles.